It is called "the race that stops a nation." And rightly so. The Melbourne Cup does more than dominate Thoroughbred racing Down Under; it mesmerizes all of Australia. Cup Day, which, as any Aussie will tell you, falls on the first Tuesday in November, is a holiday throughout Victoria. And judging from the number of empty offices and unanswered phones in Sydney and Canberra, it is a national holiday in everything but name. What sort of numbers are required to "stop a nation?" If attendance at the 2003 Super Bowl had been proportionate to the throng of Australians at the 2002 Melbourne Cup, more than a million spectators would have descended upon San Diego's Qualcomm Stadium to watch Tampa Bay thrash the Raiders. ABC's ratings would have tripled on Oscar night if a similar-sized TV audience had tuned in for the Academy Awards. And in this country of 20 million the total betting pool on the race? A cool $150 million. Mark Twain said, "Nowhere in the world have I encountered a festival of people that has such a magnificent appeal to the whole nation. The Cup astonishes me." 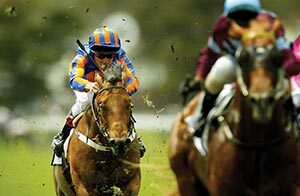 Like the Tour de France, Victoria's Spring Racing Carnival is a lengthy affair that encompasses six weeks of races at Melbourne's four principal tracks. Even the smaller, regional ones pitch in. The result is that, although Sydney is clearly Australia's commercial hub, the state of Victoria and its capital, Melbourne, retain their position as Australia's horse racing mecca. At no time is this more evident than on Cup Day. Since the Cup's first running in 1861, no war has pre-empted it; no calamity has postponed it. It is this rare combination, revelry and permanence, that attracts the vast majority of race goers. No doubt a few of the models and moguls and college kids can read a racing form, but most fans at Australia's most popular sporting spectacle are there simply to celebrate the country's favorite rite of spring. The most recent running of the Melbourne Cup, however, was before a more pensive, cautious crowd. Three weeks earlier, on October 12, a series of deadly bombs destroyed two crowded Bali beach clubs. Given the resort's popularity with Australians, it quickly was apparent that the island nation would bear the brunt of the casualties. Months later, Indonesian officials determined that more than 200 people had perished. Almost half were Aussies. On arrival at Flemington Racecourse on November 5, race goers were greeted by Kevlar-clad policemen, many armed with automatic weapons. Security cameras and plainclothes personnel anxiously eyed the crowd. But few nerves were as frayed as those of the trainers slated for the seventh race. Each busied himself by pacing alongside his mount or counseling his jockey as all anticipated the race that would stop a nation. Although the Melbourne Cup is one of the world's premier stakes races, U.S. trainers rarely enter. Not only does it conflict with the all-important Breeder's Cup, but winning this race requires a breed of Thoroughbred that is almost extinct in the States: a stayer. The Kentucky Derby and the Preakness barely eclipse a mile. The Belmont Stakes, which has derailed Triple Crown bids by Bold Venture, Alysheba, and Spectacular Bid, is considered grueling at a mile and a half. The Melbourne Cup is a two-miler. And as the zenith of Australian racing, it is the overt goal or unspoken ambition of every breeder, every trainer, and every jockey in the land. This homefield advantage is so pronounced that only once in 141 years has an international entry claimed the Cup: Vintage Crop in 1993. Three years earlier, American trainers had lost their stranglehold on the Triple Crown when Go and Go became the first foreign entry to win the Belmont. 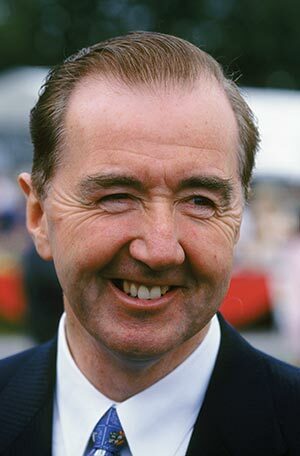 Both were trained by Dermot Weld. 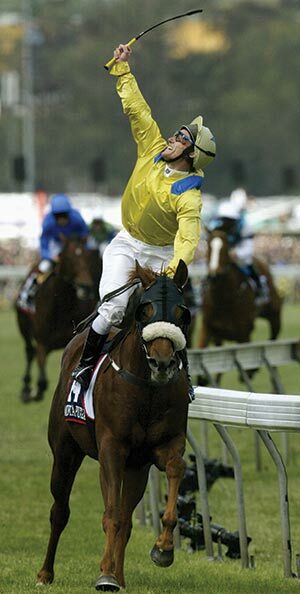 News of the Irishman's decision to race for the 2002 Cup electrified Australia. At 54, Weld is already the winningest trainer in Irish history. 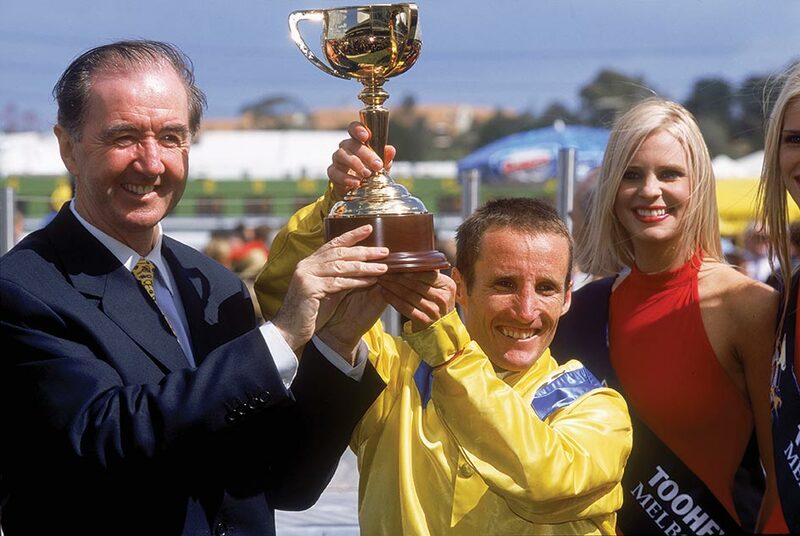 His 1993 campaign with Vintage Crop was a tour de force that stung Australia's racing community. Schooled as a jumps jockey and trained as a veterinarian, Weld nurtured Vintage Crop through stomach ulcers and a painful sacroiliac condition, all the while playing down his horse's chances. In light of his performances both on and off the track, Australian journalists bestowed upon Weld a telling nickname: the Irish Wizard. Of this gifted horseman one reporter wrote, "He raises guile to an art form." But Weld had little chance of sandbagging the press in 2002. From his stables in the Curragh he mustered a formidable pairing: Europe's champion stayer, Vinnie Roe, a winner of three Group 1 races, with Pat Smullen, a two-time Irish jockeys' champion. Weld also sent a six-year-old American horse by the name of Media Puzzle. Compared with his stablemate, however, the chestnut gelding was anything but a favorite. With no major victories and the lingering effects of a fractured pelvis, Media Puzzle was rated a 140-1 long shot by savvy oddsmakers. Australia's top jockey, Damien Oliver, had the unenviable task of qualifying Media Puzzle in the hotly contested Geelong Cup. If the horse finished in any place but first, it was back to Ireland. A win, however, and Media Puzzle would race for the Cup. Ollie, as Oliver is known throughout Australia, not only triumphed at Geelong, but he guided Media Puzzle to a new track record in the 2,400-meter race. The long shot and his Aussie jockey immediately became a favorite of the fans. Bookies took notice, too, as did Australian trainers such as 11-time Cup winner Bart Cummings and the venerable George Hanlon, dean of Australian racing. So did HH Sheikh Mohammed bin Rashid Al Maktoum, crown prince of Dubai and Defense Minister of the United Arab Emirates. 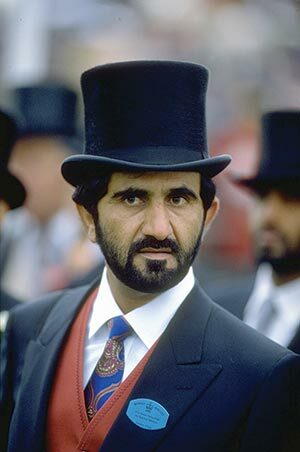 Since 1994, the Sheikh's Godolphin Stables has won an astounding 95 Group 1 races in Europe, Asia, the United States, and his native Dubai. The Melbourne Cup, however, is noticeably absent from His Highness's trophy case. And with Vinnie Roe and Media Puzzle emerging as a formidable dual entry, an even greater challenge now awaited his three hopefuls: Pugin, Beekeeper and Hatha Anna. Yet with only a week to go, a much different horse completely changed the complexion of the raceand this one wasn't even in the running. Woefully named, Savage Cabbage was an untested two-year-old. More to the point, during a trial race at Perth's Belmont Park, the colt broke a foreleg and crashed to the track. So, too, did its jockey. Thrown headfirst beneath the tumbling horse, Jason Oliver was rushed to Royal Perth Hospital. His brother Damien immediately left Melbourne for Perth to join their mother, Pat, in a bedside vigil. As the family endured, all of Australia sympathized. Over the past eight decades, the Oliver family has earned a distinguished place in Australian racing. The patriarch, a West Australian by the name of Gerry Oliver, first mounted a Thoroughbred in the late 1930s. Respected as a jockey, Gerry Oliver went on to win hundreds of races and even rode to victory in the 1965 Kalgoorlie Cup. But he was nowhere near the horseman his son Ray became. In his rookie season Ray took home top honors as West Australia's champion apprentice jockey. He repeated this feat the following year, won the Perth Cup twice, and created quite a name for himself on the West Australian racing circuit. Then came the Boulder Cup in 1975. Ray's death at the track was a harrowing accident. Five horses at full gallop toppled end over end after the frontrunner, Dream Merchant, stumbled while rounding a turn. A chain reaction ensued, snaring Catch A King and then Chicago Morn, Honey Isle, and finally Ray Oliver's mount, Yandanooka. Four jockeys survived. Ray Oliver didn't, as Australians soon learned, and left a widow and two sons: Jason, 5; and Damien, 3. Ray's widow, Pat, knew better than to dissuade her boys from following the family's calling. Jason was particularly adamant and began riding professionally at the age of 13. He won rookie honors in Perth in his first full season, just as his father had done decades before. Then he moved to Melbourne, where he signed on to ride for one of Australia's top trainers, Freedman Stables. But Melbourne wasn't a good fit for the Perth jockey. After three months he returned to West Australia. There, over the next two decades, he brought home 690 winners, many at tracks where his father and grandfather had ridden. But Jason Oliver had made his mark in Melbourne. He had taken his career further than any Oliver before him. He knew, though, that someone would take it further still. Before he left Melbourne and returned to Perth he asked Lee Freedman to give his younger brother the same opportunity that he'd been offered at Freedman Stables. In his words, "My brother will be a champion one day." Damien Oliver so idolized his older brother that he literally followed in his footsteps when he left Perth for Melbourne. There, he was welcomed at the same Freedman Stables where his brother had apprenticed, and began a rise to the top of Australian racing that can best be described as meteoric. The culmination came in 1995, on the first Tuesday in November. Thanks to a brilliant effort on Freedman-trained Doriemus, Damien and the Oliver family won their first Melbourne Cup. He was 23. 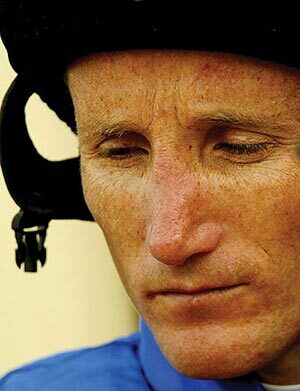 But with a week to go before the 2002 Melbourne Cup, Australia's finest jockey had abandoned all thoughts of a second Cup as Jasonhis mentor, his best friend, his brotherlapsed into a deathly coma. Hospital specialists offered little hope; no miracle would save the young man. Soon after Jason was taken off life support, his vital signs faltered, and the 33-year-old succumbed. Millions of shocked racing fans grieved with the family. Millions more speculated whether Damien would ride for the Cup. By midweek he announced that he would return to race in the Victoria Derby that Saturday and the Melbourne Cup the following Tuesday. Would Jason have wanted it any other way? Stunned by the same tragedy that had robbed him of his father, Damien had no way of knowing how closely his countrymen would follow his quest. Australia's own loss, the murder of 88 of its sons and daughters by still nameless terrorists, had not even begun to heal. The nightly news regularly reported the status of the many survivors of the Bali bombings as they struggled to stay alive in burn centers and hospitals nationwide. Damien's courageous return to the track said something about Australians; on a more visceral level, it said something to Australians about themselves. Three days prior to the Melbourne Cup, a crowd of more than 100,000 cheered his return to Flemington on Victoria Derby Day. Not only was Damien's bravery laudable, but he was also the defending Derby champion. Yet in race after race, it became all too evident that the heartbroken jockey could no longer coax home a winner. In seven outings on Derby Day, Damien finished no better than sixth. Three days later, on the first Tuesday in November, he rode in five races prior to the Melbourne Cup. Not one of his mounts finished in the money. As 3:10 p.m. approached on Cup Day, 23 jockeys on 23 horses made their way to the starting gates at Flemington Racecourse. At the same time, four out of every ten Australians put down whatever they were doing to be in front of a TV. For the 142nd time since 1861, the Melbourne Cup stopped the nation. "Lights flash. Racing!" Track announcer Greg Miles's call heralded a clean start as the crowded field broke from the gates and thundered down the turf toward the packed grandstands. Despite 12 lackluster performances, or perhaps because of those dozen gutsy rides, Damien Oliver had gone off as the favorite at the betting windows, with Media Puzzle's odds slightly better than those of his stablemate, Vinnie Roe. Distinctly Secret, one of seven New Zealand contenders, was third favorite, followed by two of the three Godolphin horses, Pugin and Beekeeper. Rain Gauge, at sixth, topped the list of Australian entries. Typical of a two-mile race, none of the favorites broke quickly. Two long shots, Sandmason and Requiem, did the dirty work and set a blistering pace as the pack passed the grandstands and went into the first turn. Just before the halfway mark, however, the opening game ended and the better horses moved up. With 1,600 meters to go, Pugin and the third Godolphin, Hatha Anna, began pouring the pressure on Sandmason down the backstretch. By the 900-meter mark, Hatha Anna had taken the lead into the back turn as Sandmason slacked off and Pugin and Vinnie Roe moved up. As the frontrunners went into the home turn, the Cup became a showdown between Dubai's Godolphin Stables and Ireland's Rosewell House. Despite his race-high handicap, Vinnie Roe failed to tire. At the front of the pack, Europe's champion stayer hugged the rail and moved into first with Pugin and Hatha Anna challenging right behind him. Coming up on the outside, Media Puzzle and Beekeeper accelerated into contention. With just 400 meters to go, all five were poised to claim the Cup. As Vinnie Roe turned into the straightaway, a roar bellowed from the grandstands at Flemington and echoed across Australia as Ollie and his once-crippled mount pulled even with the champion Irish jockey and his gallant horse. With 350 meters to the wire, Damien asked Media Puzzle to go to the front. The chestnut gelding lunged forward with such a burst of speed that his jockey later confessed that he thought he had lost the race by sending him too soon. The Irish Wizard's two horses dueled down the stretch, then a neck became a length, and then two lengths, and then three as all 22 horses trailed Media Puzzle. 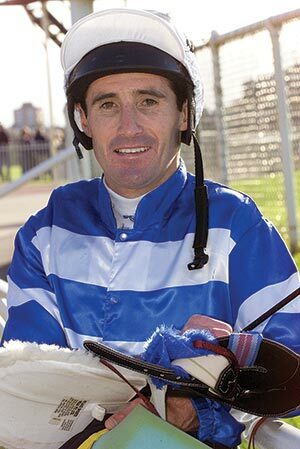 "But Damien Oliver, riding with the spirit of Jason, has broke free on Media Puzzle. I think he's got the Cup won. Beekeeper, Mr. Prudent are running on from Vinnie Roe. But it's Media Puzzle clear. Media Puzzle, Damien, and Dermot have done it!" As Media Puzzle streaked past the winning post in 3:16.9, his jockey stood out of his saddle, put a hand to his lips, and blew a kiss to the heavens in gratitude to his brother. "My boy, my boy," Damien shouted, as he thrust his crop skyward again and again and again. It was a moment that would be played and replayed on Australian television countless times in the days and weeks following the Cup and is still played to this day. As horse and rider loped back toward the grandstands, Damien's trademark toothy grin found its way back on his face for the first time in a week. And, for the first time in more than a month, the same could be said of Australia. Less than 24 hours after it graced the awards stand, the 2002 winning jockey's Melbourne Cup trophy traveled across Australia to Perth. Before more than 2,000 mourners in attendance at Redemptorist Monastery Catholic Church, it adorned Jason Oliver's casket along with a photograph of the jockey in a photo finish, a West Coast Eagles jersey, one of his ties, and the cell phone he never turned off. And a set of Jason's riding silks. 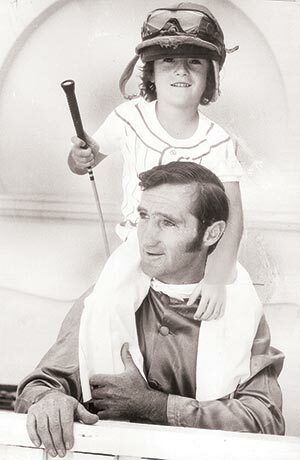 As everyone who had watched the Melbourne Cup knew, Damien had worn his brother's riding silks to victory, complete with "Jason Oliver" on the leg. Moments after the momentous race, as he rode to the Winner's Enclosure, Damien had been interviewed. Awkward in the best of circumstances, the media intrusion was dealt with in typical Aussie fashion; Ollie was forthright and direct, saying, "Melbourne Cups don't mean a thing to me anymore. I'd give it back right now to have my brother back." In Perth, Pat Rudland had been spared the intense scrutiny her son had to endure. In 1975, her 34-year-old husband, Ray, had been killed in a Thoroughbred race. In 2002, her 33-year-old son, Jason, was lost to the same fate. According to close family friend Neil Pinner, on the Tuesday that Jasons life support was turned off, Pat made her way to a chapel. There, she made a dealwith her late husband, Pinner says. "Pat said to Ray, 'I have had 33 wonderful years, and now it's your time to look after him and love him.'" Following the service, an honor guard of jockeys, led by Damien himself, accompanied both casket and Cup to the cemetery. There the fallen rider was united once again with his father.